Insect control products that carry our mark are guaranteed to contain the 100% natural insecticide active ingredient, Australian Natural Pyrethrins®. 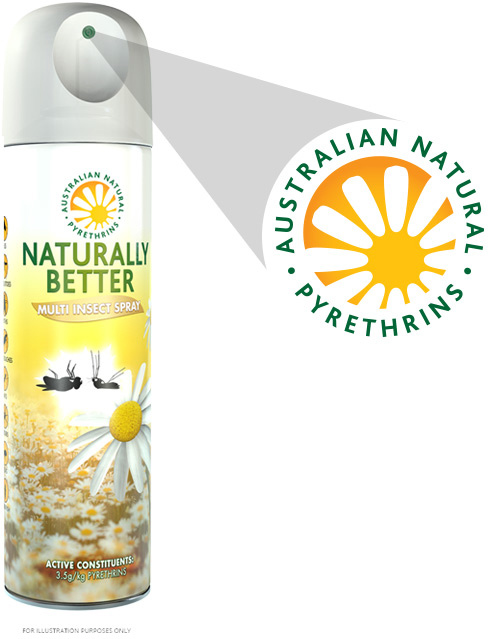 Sustainably extracted from Australian grown pyrethrum daisies by Australian farming families, pyrethrins is a naturally effective alternative to synthetic insecticide actives. Its low mammalian toxicity¹ and biodegradability in sunlight make it suitable for use in the most sensitive environments, quickly and effectively killing nuisance and problem insects. Look for the logo. Check for ‘pyrethrins’ in the list of active constituents on the product label. ¹Environmental Protection Agency – Toxicity Category III classification (40 CFR 156.62 Toxicity Category). Based on product data for Pyrethrins 50% TK containing Australian grown and extracted pyrethrins active ingredient. DISCLAIMER Australian Natural Pyrethrins® (ANP) is a registered trade mark of Australian Natural Pyrethrins Pty Ltd. The ANP mark, and claims made by Australian Natural Pyrethrins Pty Ltd and any related third parties in association with the mark, refer exclusively to the active ingredient (syn. constituent), pyrethrins. The use of, or association with, the mark does not evoke a representation, warranty, or endorsement of any product(s), only that the product(s) contain the active ingredient (syn. constituent), pyrethrins extracted from Australian grown pyrethrum daisies. Products bearing the mark can contain synthetic ingredients, including synthetic active ingredients (syn. constituents) which may, or may not, be approved inputs/materials for use in organic production systems depending on the organic control body. For more information on a product’s complete ingredients consult the product label and/or product safety data sheet (SDS). Always exercise caution when using insect control products and carefully follow the label directions.